- Significant Earthquakes in China. - West of 105°E region. - East of ~105°E region. - China Neotectonic and Geodynamic. Some Significant Earthquakes in China. China is a country of intense midland seismicity. There are many historical earthquake reports from China, the earliest dating back to 23 BC , but only very few about volcanic eruptions. 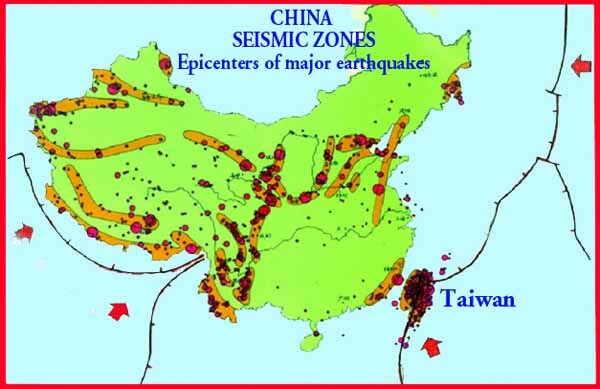 The seismicity in China cannot be fully explained by plate tectonics theory. The Chine earthquakes are not only concentrated within plate-boundary zones. Most China's earthquakes in occur within the interior of the Eurasian plate. China is a country of intense midland seismicity. Most earthquakes in China occur within the interior of the Eurasian plate. Seismicity in China and neighboring regions. Blue dots are the epicenters of historical earthquakes before 1900 A.D., and red dots are those from 1900 to 1990. The green fault-plane solutions are from the Harvard catalog (1976–2004) without scaling. Solid lines are active faults. 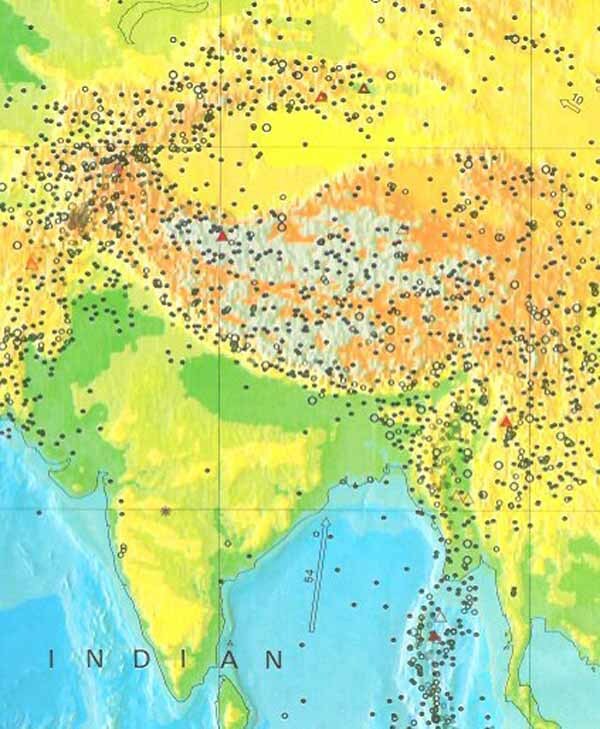 The collision between the Indian subcontinent and the Eurasian continent, causing frequent large earthquakes between India and Tibet and throughout Tibet and surrounding areas (shown by circles and dots on this map). 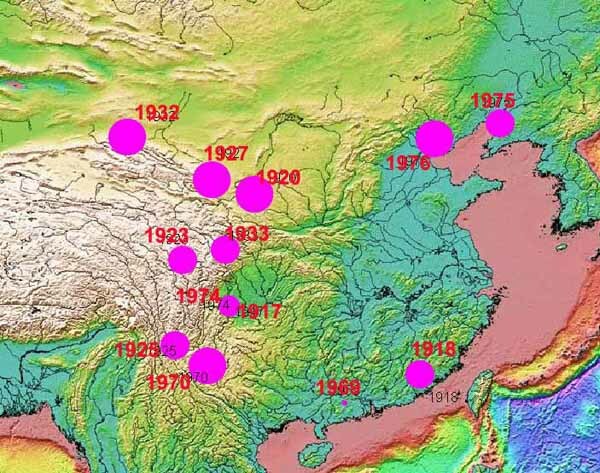 Significant Earthquakes in China (1917 - 2010). Recent Earthquakes in China (information from USGS). Simplified map of major geological units in continental China and their relative motion (mm/yr) with respect to stable Siberia, based on Quaternary fault-slip rates and other neotectonic data (Ma, 1989; Deng et al., 2002). Thin lines are active faults. WG—Weihe graben; SG—Shanxi graben; YR—Yinchuan rift; HR—Hetao rift; BB—Bohai Basin. On a continental scale, the seismicity of central and eastern Asia is a result of northward convergence of the India plate against the Eurasia plate with a velocity of about 50 mm/y. The convergence of the two plates is broadly accommodated by the uplift of the Asian highlands and by the motion of crustal material to the east away from the uplifted Tibetan Plateau.The collision of the Indian plate into the Asian plate (convergence) activated faults that had both convergent and transform components to them. The territory of China is divided into two parts in terms of seismicity, neotectonic, geodynamics. Border can be made from 105 meridian. The earthquakes in western China (approximately west of 105°E) occur within the diffuse Indo-Eurasian plate-boundary zone (E-W–trending fault systems), which extends thousands of kilometers into Asia. 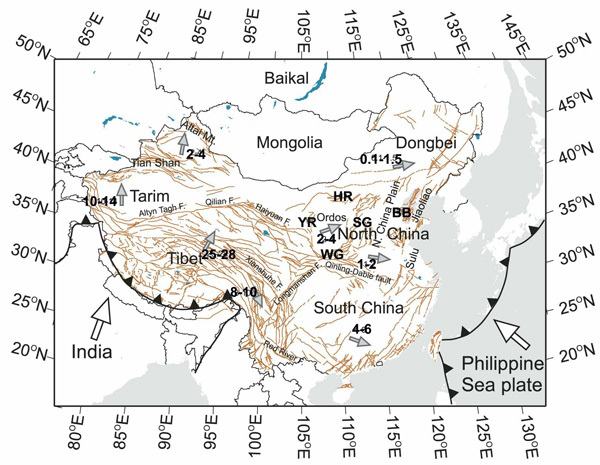 Quaternary fault movements and global positioning system (GPS) measurements indicate a strong influence of the Indo-Asian collision on crustal motion in continental China. The effects of the collisional plate-boundary force are largely limited to western China. Quaternary tectonics is clearly controlled by the Indo-Asian collision, which has caused roughly N-S crustal contraction over a broad region extending from the Himalayan front all the way to the Altai Mountains. Deformations are largely localized within the roughly E-W–oriented fault zones that separate the region into a hierarchy of tectonic units. Within each unit, deformation is relatively coherent. The first order tectonic units include the Himalayan-Tibetan Plateau, the Tarim block, and the Tianshan mountain belt. The Himalayan-Tibetan Plateau is bounded on the southern side by the Indo-Eurasian plate-boundary fault zone, where Holocene slip rates are as high as 15–18 mm/yr (Lavé and Avouac, 2000) and seismicity is intense. The northern side of the plateau is marked by the sinistral Altyn Tagh–Qilian–Haiyuan fault system. Estimates of Holocene slip rates on these faults vary signifycantly among previous studies: ~4–30 mm/yr on the Altyn Tagh fault and ~3–19 mm/yr on the Haiyuan fault (Peltzer et al., 1989; Peltzer and Saucier, 1996; Deng et al., 2002; Lasserre et al., 2002). The Tarim Basin is a rigid block with little internal deformation or seismicity (Avouac et al., 1993; Lu et al., 1994; Allen et al., 1999; Molnar and Ghose, 2000; Kao et al., 2001; Yang and Liu, 2002). The Tianshan mountain belt has been rejuvenated by the Indo-Asian collision since the Tertiary. Across the Tianshan mountain belt, active crustal shortening is 7–15 mm/yr estimated from balanced crustal sections. The amount of shortening decreases from west to east along the mountain belt (Deng et al., 2002). The Tianshan mountain belt is bounded by thrust and strike-slip faults with intense seismicity, manifesting the far-field impact of the Indo-Asian collision. Cenozoic fault systems are predominantly oriented NNE and NWW, reflecting the influence from both the Indo-Eurasian collision and subduction of the Pacific and the Philippine Sea plates (Deng et al., 2002; Zhang et al., 2003). Active crustal motion on these faults, however, may be influenced by the Indo-Asian collision (Tapponnier and Molnar, 1977; Zhang et al., 2003). In the East of ~105°E, the influence of Indo-Asian collision is less clear. The rates of Quaternary crustal deformation are much lower than in western China. 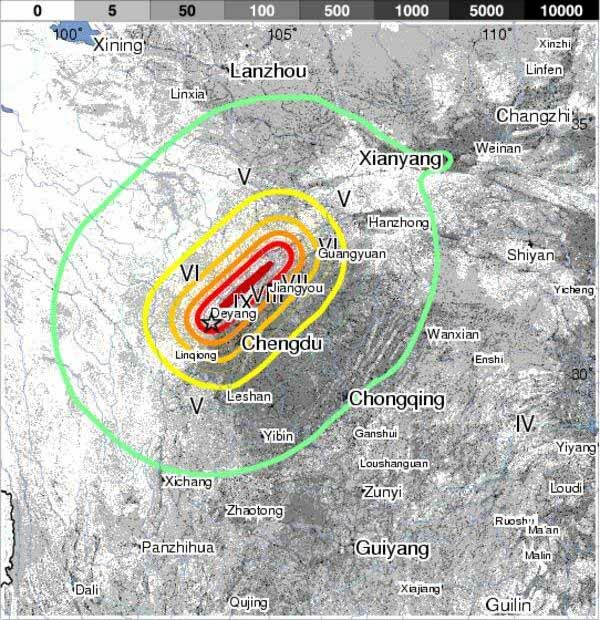 Major deformation, seismicity and most earthquakes in eastern China occur within the North China block. The South China block, on the other hand, is seismically quiescent. The North China block is one of the most active intraplate seismic regions in the world, with intense historic and modern events. Some workers have ascribed the high seismicity in the North China block to its lithospheric structures (Ma, 1989). The North China block is part of the Archean Sino-Korean craton. - the Weihe graben (WG) to the south. The North China Plain is a region of Mesozoic-Cenozoic rift basins and uplift structures crosscut by a system of NNE- and NWW-oriented fault zones, on which many large modern earthquakes have occurred, including the 1976 Tangshan earthquake. The North China Plain is separated from the Bohai Basin (BB) and other coastal regions (collectively called the Jiaoliao block for the northern part and the Sulu block for the southern part) by the Tanlu fault zone, a major structure in east Asia and the locus of numerous large earthquakes, including the 1668 M = 8.5 Tancheng event. The intense seismicity in the North China block, and the lack of seismicity in the South China block, may be explained primarily by the tectonic boundary conditions that produce high deviatoric stresses within the North China block but allow the South China block to move coherently as a rigid block. Within the North China block, seismicity is concentrated in the circum-Ordos rifts, reflecting the control of lithospheric heterogeneity. North of the North China block, there is the relatively stable Siberian shield, where the major Quaternary crustal deformation is extension across the Baikal rift zone. Within China, this region is called the Dongbei or Mongolian-Alashan block; here, the Quaternary crustal deformation and seismicity are weak. The South China Block is south of the North China block and is separated from it by the Qingling-Dabie fault zone and from the Tibetan Plateau by the Longmanshan–Xianshuhe–Red River fault system. Within the South China block, Quaternary deformation is minor, and seismicity is quiescent relative to the North China block. India has penetrated over 1500 km into Asia. The collision between the Indian subcontinent and the Eurasian continent continues today, produced the Himalaya and the Tibetan Plateau. The GPS and neotectonic studies of continental China provide useful kinematic information about the geodynamics of crustal deformation and seismicity. 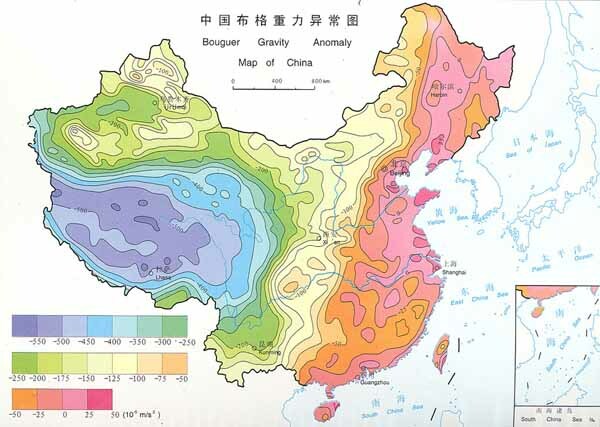 Bouguer Gravity Anomaly Map of China. - gravitational spreading of the Tibetan Plateau. 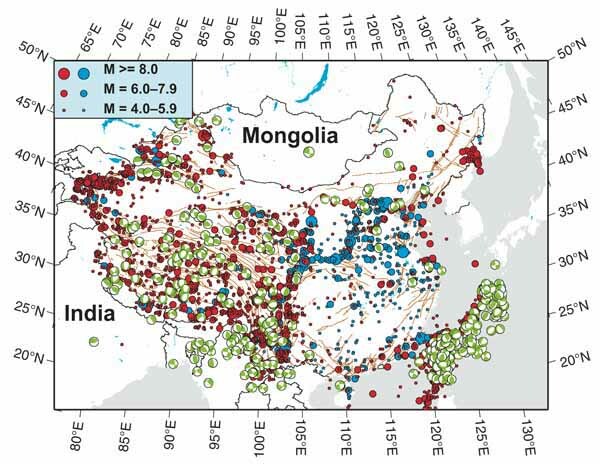 The direct impact of the Indian indentation is limited to western China, whereas gravitational spreading of the Tibetan Plateau has broad impact on most of East Asia. The influence of plate-boundary forces along the subduction zones around the eastern margins of the Asian continent is minimal at present but may have played an important role in early Cenozoic. A magnitude 7.9 earthquake occurred in the Eastern Sichuan area of western China on Monday, May 12, 2008 at 2:28 PM local time. It occurred at a depth of about 19 kilometers (11.8 miles). The earthquake destroyed numerous communities, leaving an estimated five million people without housing. Severe damage was caused by landslides which dammed rivers and flooded lands upstream. The government estimated that about 70,000 people were killed as a direct result of the earthquake. The earthquake was felt throughout China and in parts of Bangladesh, India, Japan, Mongolia, Nepal, Pakistan, Russia, Taiwan, Thailand and Vietnam. Numerous strong aftershocks caused extensive damage collapsing thousands of homes and killing thousands of people. Intensity Contour Map: USGS Map of MMI (Modified Mercalli Index) contours plotted over population per ~1 square km (see gray scale bar on top of map). The regions of integer MMI values are separated by the thick contour lines and labeled with Roman numerals. The Sichuan earthquake of May 12, 2008, occurred as the result of motion on a northeast striking reverse fault or thrust fault on the northwestern margin of the Sichuan Basin. The earthquake's epicenter and focal-mechanism are consistent with it having occurred as the result of movement on the Longmenshan fault or a tectonically related fault. The earthquake reflects tectonic stresses resulting from the convergence of crustal material slowly moving from the high Tibetan Plateau, to the west, against strong crust underlying the Sichuan Basin and southeastern China. Allen, M.B., Macdonald, D.I.M., Xun, Z., Vincent, S.J., and Brouet, M.C.,1998, Transtensional deformation in the evolution of the Bohai Basin, northern China, in Holdsworth, R.E., Strachan, R.A., and Dewey, J.F.,eds., Continental Transpressional and Transtensional Tectonics: Geological Society of London Special Publication 135, p. 215–229. Allen, M.B., Vincent, S.J., and Wheeler, P.J., 1999, Late Cenozoic tectonics of the Kepingtage thrust zone: Interactions of the Tien Shan and the Tarim Basin, northwest China: Tectonics, v. 18, p. 639–654, doi:10.1029/1999TC900019. Avouac, J.-P., and Tapponnier, P., 1993, Kinematic model of active deformation in Central Asia: Geophysical Research Letters, v. 20, p. 895–898. Burchfiel, B.C., Peizhen, Z., Yipeng, W., Weiqi, Z., Fangmin, S., Qidong, D.,Molnar, P., and Royden, L., 1991, Geology of the Haiyuan fault zone, Ningxia-Hui autonomous region, China, and its relation to the evolution of the northeastern margin of the Tibetan Plateau: Tectonics, v. 10, p. 1091–1110. Deng, Q.D., Zhang, P.Z., Ran, Y.K., Yang, X.P., Min, W., and Chu, Q.Z., 2002,Basics characteristics of active tectonics of China (in Chinese): Science in China, v. 32, p. 1020–1030. Kao, H., Gao, R., Rau, R.J., Shi, D., Chen, R.Y., Guan, Y., and Wu, F.T.,2001, Seismic image of the Tarim Basin and its collision with Tibet: Geology, v. 29, p. 575–578, doi: 10.1130/0091-7613(2001)029<0575:SIOTTB>2.0.CO;2. Lasserre, C., Gaudemer, Y., and Tapponnier, P., 2002, Fast late Pleistocene slip rate on the Leng Long Ling segment of the Haiyuan fault, Qinghai, China: Journal of Geophysical Research, v. 107, no. B11, 2276, doi:10.1029/2000JB000060. Lavé, J., and Avouac, J.-P., 2000, Active folding of fl uvial terraces across the Siwaliks Hills, Himalayas of central Nepal: Journal of Geophysical Research, v. 105(B3), p. 5735–5770, doi: 10.1029/1999JB900292. Liu, M., Yang, Y., Shen, Z., Wang, S., Wang, M., and Wan, Y., 2007, Active tectonics and intracontinental earthquakes in China: The kinematics and geo dynamics, in Stein, S., and Mazzotti, S., ed., Continental Intraplate Earthquakes: Science, Hazard, and Policy Issues: Geological Society of America Special Paper 425, p. 299–318, doi: 10.1130/2007.2425(19). Lu, H., Howell, D.G., Jia, D., Cai, D., Wu, S., Chen, C., Shi, Y., Valin, Z.C., and Guo, L., 1994, Kalpin transpression tectonics, northwestern Tarim Basin, western China: International Geology Review, v. 36, p. 975–981. 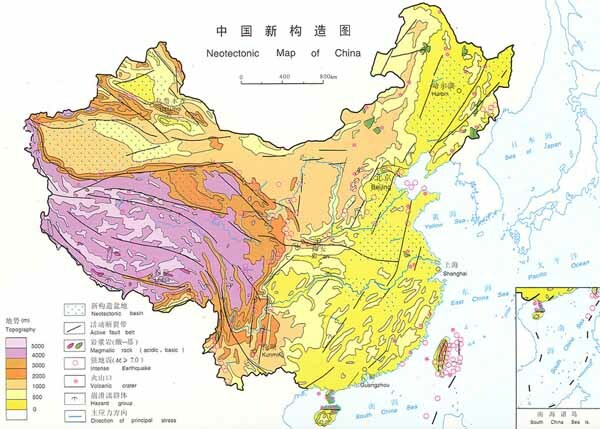 Ma, X., 1989, Atlas of Lithospheric Dynamics of China: Beijing, China Cartographic,787 × 1092, 37 1/2 printed sheets. Molnar, P., and Ghose, S., 2000, Seismic movements of major earthquakes and the rate of shortening across the Tien Shan: Geophysical Research Letters, v. 27, p. 2377–2380, doi: 10.1029/2000GL011637. Peltzer, G., Tapponnier, P., and Amijio, R., 1989, Magnitude of late Quaternary left-lateral displacement along north edge of Tibet: Science, v. 246, p. 1285–1289, doi: 10.1126/science.246.4935.1285. Peltzer, G., and Saucier, F., 1996, Present-day kinematics of Asia derived from geologic fault rates: Journal of Geophysical Research, ser. B, Solid Earth and Planets, v. 101, p. 27,943–27,956, doi: 10.1029/96JB02698. Tapponnier, P., and Molnar, P., 1977, Active faulting and tectonics in China: Journal of Geophysical Research, v. 82, p. 2905–2930. Tapponnier, P., and Molnar, P., 1979, Active faulting and Cenozoic tec tonics of Tien Shan, Mongolia and Baikal regions: Journal of Geophysical Research, v. 84, p. 3425–3459. Wesnousky, S.G., Jones, L.M., Scholz, C.H., and Deng, Q., 1984, Historical seismicity and rates of crustal deformation along the margins of the Ordos block: North China: Bulletin of the Seismological Society of America, v. 74, p. 1767–1783. Xu, X., Ma, X., and Deng, Q., 1993, Neotectonic activity along the Shanxi rift system, China: Tectonophysics, v. 219, p. 305–325,doi: 10.1016/0040-1951(93)90180-R.
Yang, Y., and Liu, M., 2002, Cenozoic deformation of the Tarim Basin and its implications for collisional mountain building in the Tibetan Plateau and the Tian Shan: Tectonics, v. 21, p. 1059, doi: 10.1029/2001TC001300. Ye, H., Shedlock, K.M., Hellinger, S.J., and Scluter, J.G., 1985, The North China Basin: An example of a Cenozoic rifted intraplate basin: Tectonics, v. 4, p. 153–170. Zhang, Y., Mercier, J.L., and Vergely, P., 1998, Extension in the graben systems around the Ordos (China), and its contribution to the extrusion tectonics of south China with respect to Gobi-Mongolia: Tectonophysics, v. 285, p. 41–75, doi: 10.1016/S0040-1951(97)00170-4. Zhang, P.Z., Deng, Q., Zhang, G.M., Ma, J., Gan, W., Min, W., Mao, F., and Wang, Q., 2003, Strong earthquakes and crustal block motion in continental China: Science in China, v. 33, p. 12–20.